What a book! 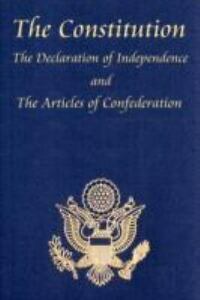 The Declaration of Independence, the Constitution, the Articles of Confederation...all in one package! It's a dream. My only nitpicky comment is I did not like the type face of the text, it was a little too serif (like Baskerville), when my eyes like sans serif (like Arial) especially for text which is very complicated and deserves extra attention. I also wish the size of the book was smaller. It measures 9 X 6, which is not conducive to a pocket book. 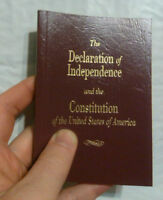 But it is a great volume with everything in it I wanted, just the documents, not any commentary or notes or opinions. I am very glad I have it. First of all, the font size is perfect for those of us who need eyeglasses. The content is precise and the book is easy to carry on, ideal for trips. As the book says, every citizen must have one of these, I think you must have an idea of how useful this book is ..otherwise you wouldn't be reading this review. P.S. : outstanding price.